Welcome to the NUSTEM magnets page! 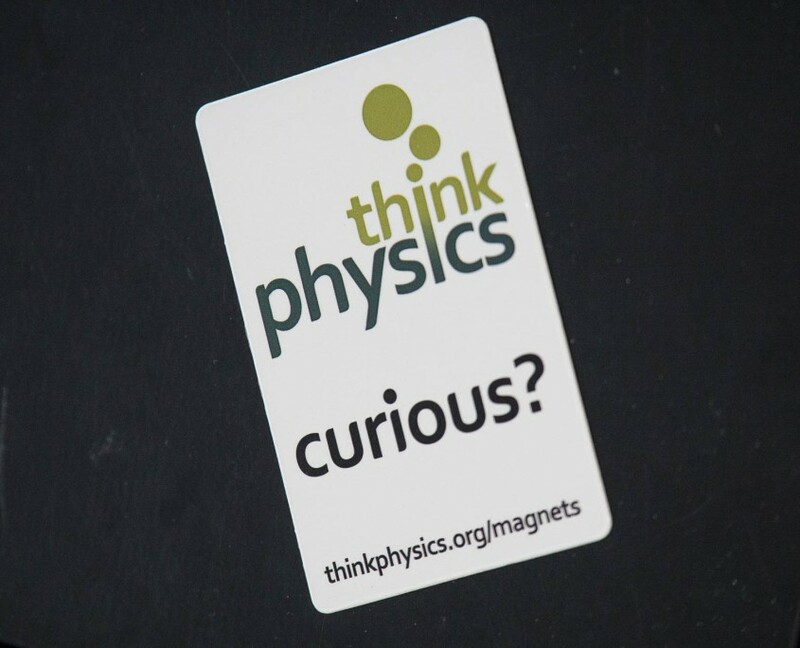 You’re probably here because you / your child / your mum or dad has in their hand a Think Physics fridge magnet, like the one shown here. So… what are you waiting for? Go and stick it to the fridge! Marvel as it seemingly defies gravity and holds up that letter from your Auntie Susan, the gas bill, or the menu from your local curry house. You already know that your magnet sticks to your fridge (we tried that earlier), but what else will your magnet stick to, what else is magnetic? Something to write on, like a notepad. Something to write with, like a pencil. A wide range of Things, and possibly some Stuff, which you’re going to test. These could be Things you assemble at the table where your notepad is, or Stuff you find lying around your house as you carry your notepad around. Take your magnet and place it on lots of different things. Every time you try a surface ask yourself two questions: What is the thing made of? and Does the magnet stick to it? Make a note of what you find out as you try different things. When you’ve finished (my best was 30 different things), see if you can spot a pattern – which type of things does a magnet stick to? You’ll have noticed that not all objects stick to the magnet. If an object sticks to a magnet we call it magnetic, if it doesn’t stick we call it non-magnetic. You may have also noticed that materials like glass, wood and plastics didn’t stick to the magnet; all these materials are non-magnetic. The materials that did stick to the magnet were probably made out of metal or had some metal in them like the fridge door. We’ll be expanding this page as our magnets workshop develops. Watch this space!